A Business Transformation, Technology Innovation and R&D professional, AI-driven Design evangelist. Since 2010 a STARTUP ENTREPRENEUR, while in the past operated as a strategy & technology consultant, specializing in the Design, Development, and Launch of innovative Smart Products and Services. As of Entrepreneur, his best expertise and the main focus is concentrated on the Luxury Fashion Retail and Mass Customization, ideas and projects towards Luxury 3.0 philosophy. Andrey is CEO and co-founder of ELSE Corp, a startup startup developing “Virtual Retail” (www.virtual-retail.org) and “Real Time Fashion System” (www.virtual-couture.org) concepts, which is a new business model and a set of technologies and processes for a complete Digital Transformation of the fashion retail chain, to enable ON DEMAND, MASS CUSTOMIZED and MADE TO MEASURE retailing, towards a SUSTAINABLE, cloud-based and HYBRID MANUFACTURING oriented supply chains. In April 2018 ELSE Corp formed a joint venture company ELSE Tech (officially branded as ATOMLab Milan) with ATOM Group, a leading shoe machinery company from Italy, which also owns ShoeMaster, one of the most important CAD/CAM software company for the footwear industry. 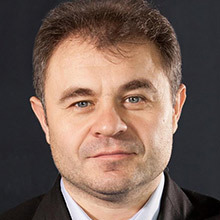 Since then Andrey is responsible within ATOMLab for new projects and products development in the areas as Virtual Retail, CAD as a Platform, Computer Vision & AI, Cloud, Digital and Hybrid Manufacturing, in the role of Deputy Chief Innovation Officer.